Hrm ... I notice that I haven't shown much sewing in my last few posts. I've been staying pretty busy on the crafty front, though! I hope to have some more finished products to share in the coming days, but for now I'll settle for some quilting bee blocks. 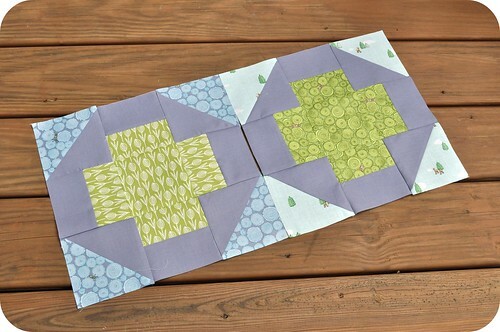 In August, I made these two Greek Cross blocks in shades of green, blue, and grey for the do. Good Stitches charity bee. 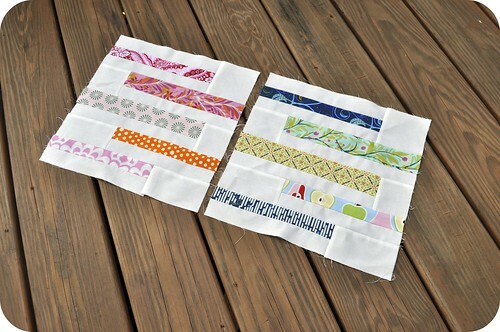 We used a tutorial by Faith of Fresh Lemons Modern Quilts for these great blocks. I'm a little ahead of the game for September and was able to whip up these two blocks, also for the do. Good Stitches bee. 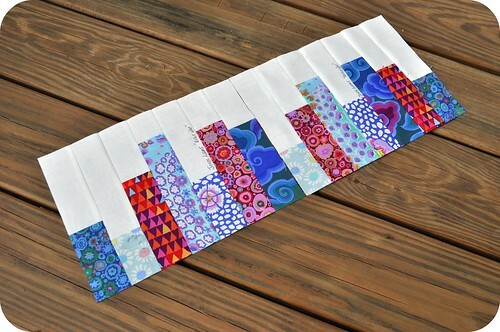 We used Alissa's free block tutorial for her Modern Block of the Month quilt-along, hosted by the great folks at Sew Mama Sew! The pink, orange, and red block will be used in a quilt for a little girl, and the blue, green, and grey for a little boy. And finally, these blocks aren't for a quilting bee, but they are for a very special project. They were made for the sweet Amy Lobsiger and her daughter, Annabel. As you can read here, Amy's husband -- a prominent journalist who covered the Detroit music scene -- recently passed away. And because quilters are the most awesome group of people together, Amy's great friends Sarah and Katy began rallying people to contribute blocks to a quilt project to honor Dan Sicko. Amy loves Kaffe Fassett fabrics. Dan loved and extensively covered the techno music scene in Detroit. And so Sarah designed these blocks -- and the quilts they will become -- to suggest the stereo bass line of a techno track. A wonderful idea, and one to which I am proud to contribute. I really enjoy all of these little gems you share! Thanks for all the hard blogging work you do, in addition to all your other jobs, to share with the world. Hello, I'm new to your site. I've long been inspired by the quilt that Krista Hennebury of Poppyprint made from your flying fish pattern. I've made my own version. I've only arranged the flying geese and hst's on my site but I've rearranged and sewn that part together now and I'm auditioning borders now. Anyhow, thanks for designing such a nice one. I've subscribed. Enjoy all of these little gems you shared with us. You did such a hard blogging work and it is perfect way to share with the world.